Banish Your Mouldy Bath Mat! 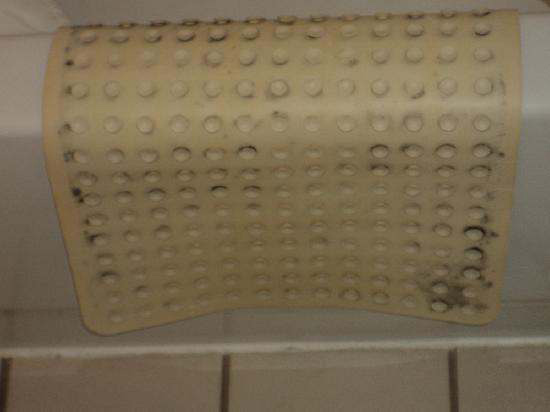 We reckon the best thing to do is take your bath mat out of bath and stick it in the bin RIGHT NOW! Then, invest in these Anti slip Bath Stickers – simply stick them down on the surface of the bath or shower, and hey presto you will be able to bathe without risking life and limb (or a ghastly rubber bath mat). Anti Slip Bath and Shower Safety Stickers are 3.5cm white self-adhesive circles with a lightly textured surface, which are stuck directly onto the bath. They are less obtrusive than a bath mat, and importantly they are always in place, so there is not the need to constantly bend own and adjust a bath mat, which can be particularly tricky for people with mobility issues. The Anti Slip Stickers can be used on baths, showers or in wet rooms, and can be arranged in a pattern to suit the shape of your bath or shower. Anti Slip Bath Stickers are easy to keep clean as part of your normal bath or shower cleaning routine – a wipe of a cloth is all it usually takes, and from time to time a gentle scrub with a soft scrubbing brush. The stickers can be removed should you ever wish to do so, but they are designed to stay in place for several years.